Here's a second helping of music from Mali, but with a different flavour. Wande Kouyaté is a djeli from a traditional Malinké griot family. 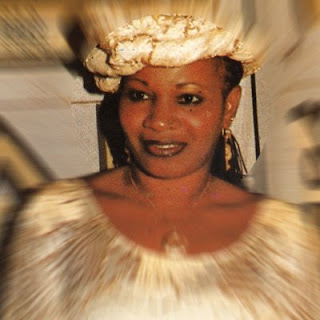 She is one of the 'older' generation of Malian divas and has been a diva for quite a long time. This cassette from 1986 is remarkable not just by the quality of Wande's singing, but also by the wonderful authentic ambience of the recording. I am certain that this recording was not made in a studio. It's too dynamic, too 'live', too real. raw yet introspective, intimate yet universal - these are fantastic recordings. the spirit of it reminds me of the guinean or malian music from one of your broadcasts; a man and woman singing with accordeon, recordings from probably 1950s-60s. i would be very happy if you could post some of these, if you grasp which i mean. but then, all the posts here are fantastic! too little time to comment on all, but please be thanked! You are referring to Petit Moussa, from Guinea. Although the quality of the recording may suggest it's from the 50's or 60's, I think it is actually from the 1980s. I will certainly post this, but later on.